1. Come into operation on 1st March 2006. 2. These Regulations apply to any premises which is a factory. (b) treatment of minor bodily injury which does not require treatment by a registered medical practitioner or nurse. (c) one Box C, 2 Box B or 4 Box A for every 100 persons. 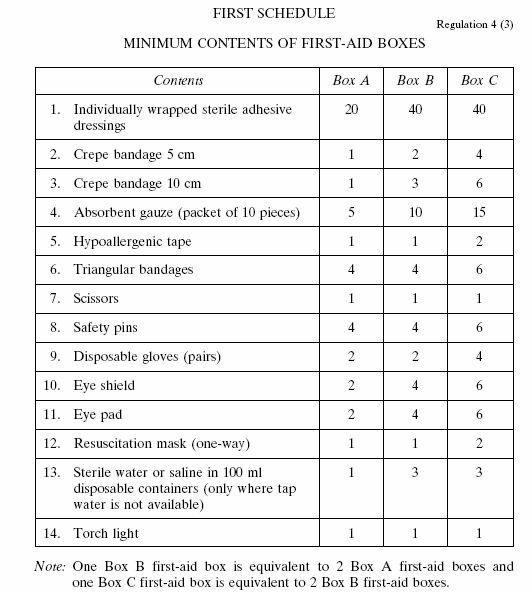 The number of first-aid boxes required on a floor of the building is determined by the number of persons employed on that floor of the building in accordance with paragraph (1). be under the charge of a person appointed by the occupier of the workplace. Nothing except appliances or requisites for first-aid shall be kept in a first-aid box. 5. More than 25 persons employed in a workplace - to appoint first-aiders who shall be readily available during working hours; number of persons to comply with the ratio specified in the Second Schedule. (b) undergo subsequent re-training in first-aid treatment. Shift work - the ratio of the number of first-aiders available on each shift to the number of persons employed at work on that shift shall comply with the ratio specified in the Second Schedule. Every first-aider shall maintain a record of all treatment rendered by him. A notice shall be affixed in every workplace stating the names of the first-aiders appointed under paragraph (1). 7. Where any worker may be exposed to toxic or corrosive substances - the occupier shall make provision for the emergency treatment of the person. Where the eyes or body of any person in a workplace may come into contact with toxic or corrosive substances, the occupier shall ensure that suitable facilities for quick drenching or flushing of the eyes and body are provided and properly maintained within the work area for emergency use. 8. Any - (a) occupier of a workplace who fails to comply; or (b) first-aider who contravenes regulation 5 (4), shall be guilty of an offence and shall be liable on conviction to a fine not exceeding $5,000. 9. 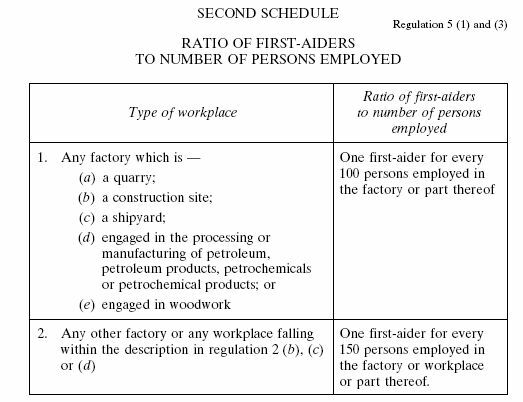 The Factories (First-Aid) Regulations (Cap. 104, Rg 13) are revoked.